What is your Favorite kind of Soups? 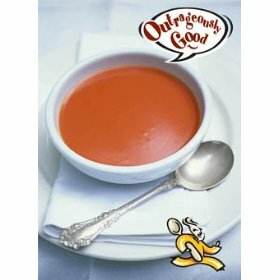 I just Got finished eating a big bowl of creamy tomato soup, It was so good! I use to order this alot in Applebees Reasturant, So I decided to try a new recipe, I got from watching a Hunting show with my Husband... one of the Guys on there had a suggestion for making a creamy tomato soup, he suggested that you use a can of milk instead of water in your tomato soup, with a little pepper to taste, and microwave it, he also suggested eating it with cheese puffs instead of crackers.. So that is what I had for dinner tonight, only I used cheese balls instead of cheese puffs. and it was so Good... yum .... What kind of soups are your favorite? do you have a certain way you fix them? Oh man! I love to eat tomato soup! It's so nice and warm and creamy and i love to put lots of nice milk into my soup. It's even better to have the soup if you eat a grilled cheese with the soup. But soup is a really nice thing to have as a comfort food. I really like mushroom soup as well. Both of those soups are amazingly cream and great to have for lunch time. There are also different soups that are even heartier like chili and different types of lentle soup. These are so filled and you can put some cheese in them to make them even more filling. I like to make these soups homemade cause i know what's in the and can make the amount that i want.